Here we go .. I will now try to start getting more new pictures and information on these gemstones from the “Owyhee” area of Oregon & Idaho. 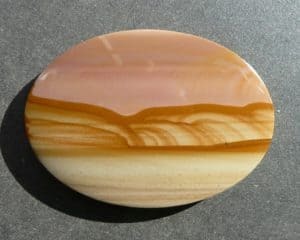 Some of these photos are from cabochons I have cut in the past years .. some I still own and some have been already sold. 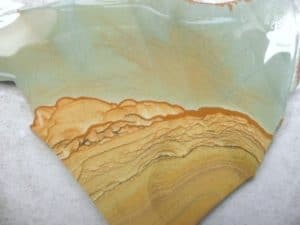 I hope to also add in pictures of raw uncut rough stone and slices .. again to try and help you as you wish to identify these gemstones from my area here. This is based from my past memories (since I started my career in this gemstone business in 1972) and I hope will be of value to you as you search the internet for some real and true information and pictures. This looks like a long term project so please “hang in there” with me as I try to keep adding more new (old) gemstones to this list (as my time allows me to do so). Have FUN !! If you have suggestions for me or think I have something wrong listed in these pages .. please contact me here ASK ME .. I will try to respond back with you ASAP !! 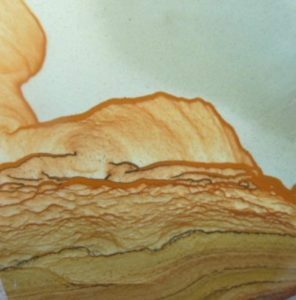 Desert Rose Picture Jasper was mined in the late 1970s to early 1980s . 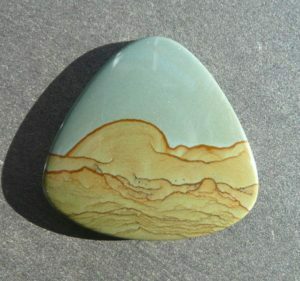 Another more rare to find picture jasper from the “Owyhee” area of southeastern Oregon. The pink color of the sky was the reason for the name “rose”. Not all of these jasper had the pink sky most had a tan colored sky. 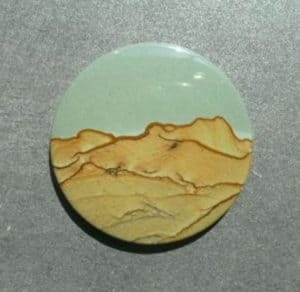 This picture jasper was found next to or nearby the Desert Rose picture jasper. Similar landscape patterns but without the pink colors. 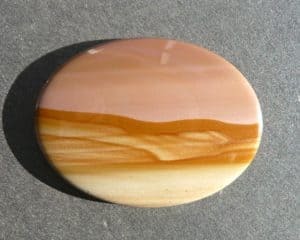 This jasper had light cream to white sky with golden orange landscape colors. 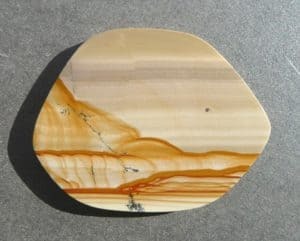 Painted Desert Picture Jasper was mined in the mid to late 1970s to the early 1980s. The original mining claims were called Jack Pot but the name of this jasper was later changed to Painted Desert. The best of it had fantastic landscapes with a very pretty light blue sky. It also had more green color tones. From the Owyhee Mountains of southeastern Oregon. Cave Mountain picture jasper from the Owyhee area of southeast Oregon. This jasper was mostly mined in the 1970s. It has a darker grey blue sky with darker brown and tan landscapes. Often it showed designs that appeared like smoke from the horizon going up into the sky.